How deeply does a story take the reader into the head of a character. Many discussions of point of view skim over the idea that POV can related to how close a reader is to a reader. But David Jauss says there are two points of view that allow narrators to be both inside and outside a character: omniscience and indirect interior monologue. This is part 2 of a 3-part series on Point of View: Techniques for Getting Inside a Character’s Head. Here are links to parts 1 and 3. These posts are inspired by an essay by David Jauss, professor at the University of Arkansas-Little Rock, in his book, On Writing Fiction: Rethinking Conventional Wisdom About Craft. 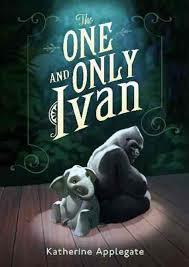 I am using Ivan, the One and Only, by Katherine Applegate, winner of the 2012 Newbery Award as the mentor text for the discussion. Omniscience. Traditionally, “limited omniscience” means that the narrator is inside the head of only one character; “regular omniscience” means the narrator is inside the head of more than one character. He spends time proving that regular omniscience never enters into the heart and mind of every character in a novel. A glance at Tolstoy’s WAR AND PEACE, with its myriad of characters is enough to convince me of this truth. Rather, Jauss says the difference that matters here is that the omniscient POV uses the narrator’s language. This distinguishes it from indirect interior monologues, where the thoughts are given in the character’s language. This is a very different question about POV: is this story told in the narrator’s language or the character’s language? Ivan tells the reader what Mack is thinking (“soon realized”) and even what those who purchase his art are thinking (“even if they don’t know what it is”). Then, he pulls back into a dramatic reporting of his daily actions. Notice, too, that he makes this switch from dramatic POV to omniscient POV within the space of one sentence. And the omniscient POV dips into two places in that sentence, too. Because Mack is Ivan’s caretaker and has caused much of Ivan’s troubles, the reader needs to know something of Mack’s character. This inside/outside level is enough, though. The author has decided that a deep interior view of Mack’s life isn’t the focus of the story. It’s enough to get glimpses of his motivation by doing just a little ways into his head. Another technique for the narrator and reader to be both inside and outside a character is indirect interior monologue. Here, Jauss says that the narrator “translates the character’s thoughts and feelings into his own language. “ (p. 45) The character’s interior thoughts aren’t given directly and verbatim. This is a subtle distinction, but an important one. Interior indirect monologue usually involves two things: changing the tense of a person’s thoughts; and changing the person of the thought from first to third. This signals that the narrator is outside the character, reflecting upon the character’s thoughts or actions. The word “reasonably” puts this into the head of the narrator, who is making a judgment call, interpreting the dramatic action. Interior indirect monologue most often seen with a third-person narrator reflecting another character’s thoughts. But in Ivan, we have a first-person narrator. Applegate stays strictly inside Ivan’s head, except for a few passages where Ivan reports indirectly on another character’s thoughts. Because the passages are already in present tense, she doesn’t have that tense change to rely on. Here’s a passage that could have been indirect interior monologue but Applegate won’t quite go there. Stella is an elephant in a cage close to Ivan. By adding “I can tell. . .” it stays firmly inside Ivan’s head. He tells us that this is true only because Ivan makes an observation. The story doesn’t dip into the interior of the other characters. But there are tiny places where the interior dialogue peeks through. This from the “bad guys” chapter. Bob is Ivan’s dog friend; Not-Tag is a stuffed animal; and Mack is Ivan’s owner. Ivan can only know that Bob “prefers” something, when he, as the narrator, dips into Bob’s thoughts. While Ivan’s story is most present tense, this is past tense because Ivan is reporting on prior events. Even here Applegate refuses to slip into interior indirect monologue. Instead, she just presents the facts in a dramatic manner and lets the reader imagine what Ivan felt. It’s interesting that withholding Ivan’s thoughts here evoke such an emotional response in the reader. “Somehow I knew that in order to live, I had to let my old life die. But sister could not let go of our home. It held her like a vine, stretching across the miles, comforting, strangling. Applegate could have chosen to stay inside Ivan, but here, she pulls back so the reader isn’t fully inside this emotionally disturbing moment. She uses indirect interior monologue, instead of direct. This has been proclaimed a mistake in writing point of view, but Jauss says it’s a normal technique. We dip into Mack’s point of view, but then pull back to a dramatic statement about what Ivan is doing. Indirect interior monologue often includes “rhetorical questions, exclamations, sentence fragments and associational leaps as well as diction appropriate to the character rather than the narrator. “ (p. 49) In one of my novels, I used a lot of rhetorical questions as a way to get into the character’s head and an editor complained about it. Now, that I know why I was using it (as a way to manipulate how close the reader was to the character), I could go back and use a variety of techniques. Knowledge of fiction techniques is freeing! Tomorrow, we’ll look at how to go deeply into a character’s head, heart and emotions. This is part 1 of a 3-part series on Point of View: Techniques for Getting Inside a Character’s Head. Join us tomorrow for the final part of the series, Inside: Going Deep into a Character’s Head. This has been part 2 of a 3-part series on Point of View: Techniques for Getting Inside a Character’s Head. Tomorrow, will be Inside: Deeply Inside a Character’s Head. Read the whole series.